In 1996, Melissa and I bought our first home. After college, I lived in a number of apartments, leased condos, and rented houses and it was not until I was 37 years old that I actually had the money for the required down payment for a home of our own. In the mid-2000’s our federal government declared anyone can have the “American Dream” of home ownership – regardless of whether you can afford the down payment, the mortgage payment, or required maintenance. However, I was taught by my parents you had to be able to meet your financial obligations. It took some time for me to work and save for that first down payment but it was all worth it. The reality is – “No, we cannot all afford the American Dream.” However, we all have opportunities with hard work, perseverance, and support to get there. That’s the story behind Our Towns Habitat for Humanity and Mia Patterson and her family. 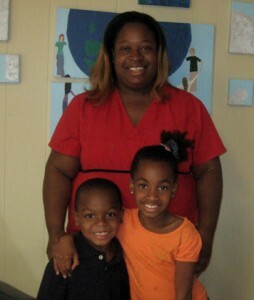 Mia, a single mother raising an 8-year-old daughter and a 5-year-old son, waited eight years for a home of her own. 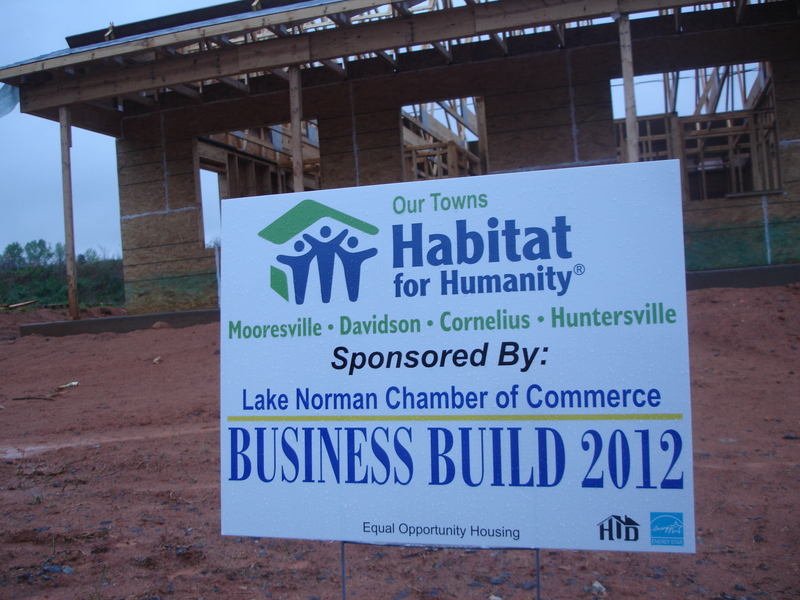 The Lake Norman Chamber partnered with Our Towns Habitat to raise money last year to build a home for Mia and her family. The project received a significant boost from Wells Fargo Bank that donated $30,000 and guaranteed an additional $20,000 in matching grants. Lake Norman Chamber members stepped up to the plate with the McIntosh Law Firm, McBryde Website Design, Champion Tire and Wheel, Carolinas HealthCare System, Kimball Morrison, and Park Avenue Properties all making early contributions. We saw the dollars tally as our own Chamber Ambassadors and the Barry family made individual contributions along with AT&T, Boatsman Gilmore Associates, and Lake Norman Chrysler Jeep Dodge Ram getting us closer to our goal of $71,500. Now the objective is to close the gap and we are just $5,500 short of reaching our goal. We are calling on our Chamber members and the public at large to help us make the “American Dream” possible. 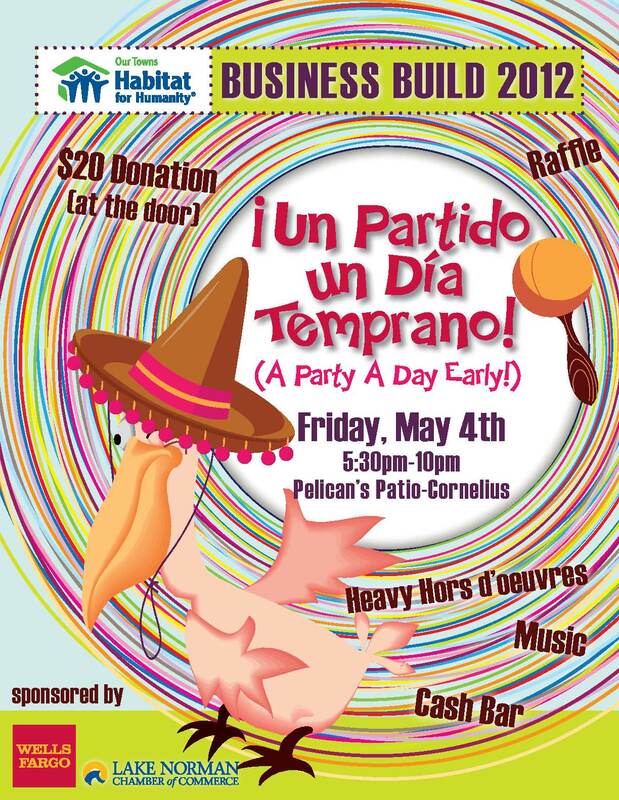 On Friday, May 4th from 5:30 to 10:00 PM Pelican’s Patio (19930 W. Catawba Ave Cornelius NC) will host a “Partido un Dia Temprano – for those who do not speak Spanish “Party A Day Early! We will have Heavy Hors d’oeuvres, Music, and a Cash Bar with a $20 donation at the door. The event is sponsored by the Lake Norman Chamber and Wells Fargo Bank. Please come out and support Habitat for Humanity and our chamber project in a fun and relaxing way. A couple of months ago, many of you had the chance to meet Mia and her family at a special Our Towns Habitat Business BeforeHours and an earlier Board of Directors Meeting. Mia’s words of gratitude for the generous outpouring of support could be seen in her eyes as she tightly wrapped her arms around her children knowing they finally had a place of their own to call home. While I believe in the American Dream, I believe many of the folks in Washington, DC just don’t get it. The American Dream is not what we gain by receiving something, it’s what we become as a community and individuals by giving something. Hope to see you at the Chamber’s Business Build fundraiser and thanks to everyone who has changed a life one family at a time!